I have a new DIY project that I'm excited to share! 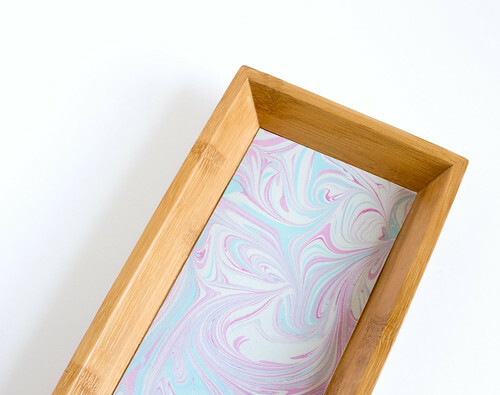 Next in my series of projects using hand marbled paper and fabrics is this practical wooden tray lined with pretty marbled paper. Pourable resin seals the paper completely and provides a clean, durable surface. 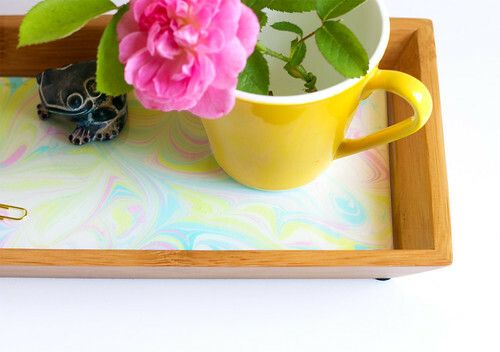 If you don't have any marbled papers handy, any decorative paper can be used for this project! Marbled paper. Learn how to make your own with my tutorial! 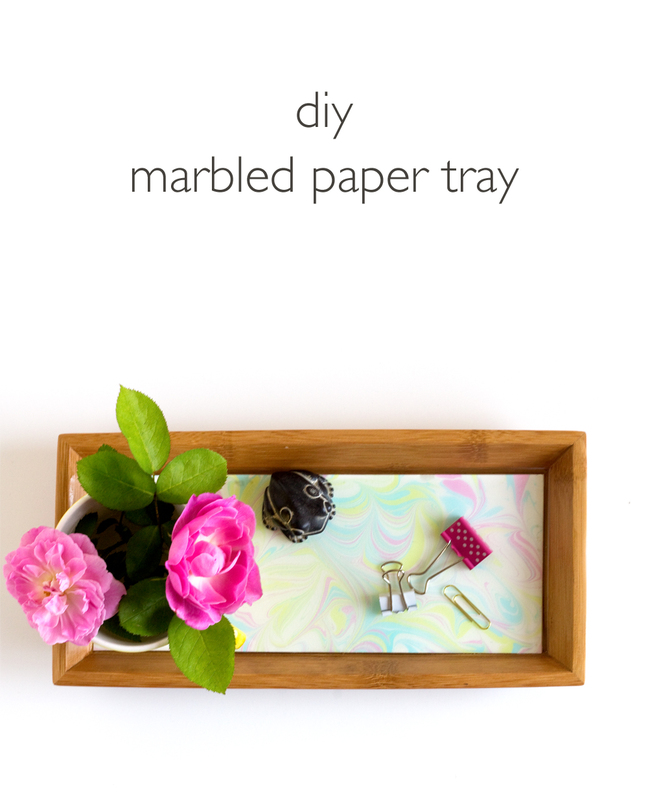 Measure the bottom of the tray and cut a scrap piece of paper to fit. Test fit the paper in the tray and trim edges where necessary. Trace the outline of paper onto the back side of the marbled paper and cut to size. Using the foam brush, apply three thin coats of ModPodge on the marbled paper, both sides, letting it dry in between coats. When the paper is dry, add strips of double-sided tape to the back edges and center of the paper and lay it into the bottom of the tray. Following the instructions on the package, mix the epoxy and the hardener together in the cup. Slowly pour it over the paper until fully coated with less than 1/8" of coverage. 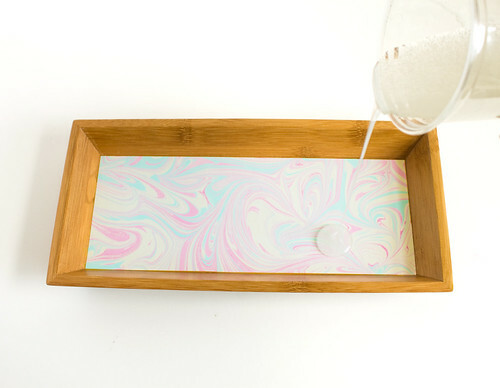 Spread the resin into the corners and edges where necessary with the stir sticks. If there are bubbles, carefully exhale onto the surface of the resin (like you would while cleaning your sunglasses) and the bubbles will disperse. Work in a well-ventilated area and follow all of the safety precautions on the product packaging. Let dry on a level surface until fully cured. You may notice the marbled paper in the first few photos is different from the finished photos. That's because I forgot to take my own advice and coat the paper in Modpodge first. Oops! It's important to seal the paper before pouring the resin because it will otherwise saturate the paper and leave a blotchy look. Sealing keeps the colors crisp and vibrant, so that's definitely what I recommend and what I did the second time around! Add another layer of resin if it is thin in some spots or if the paper sticks up in any areas. 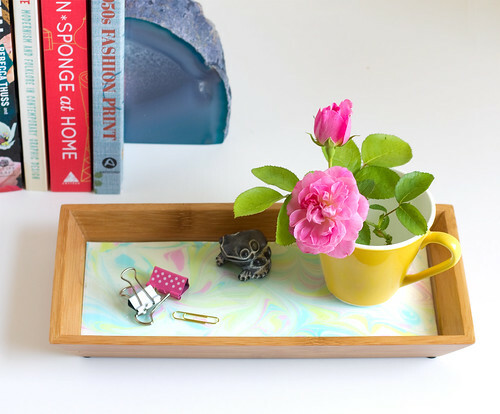 Use your new tray as a catch-all by the front door or to hold office supplies at your desk. It's a fun way to bring in a pop of custom color and pattern! 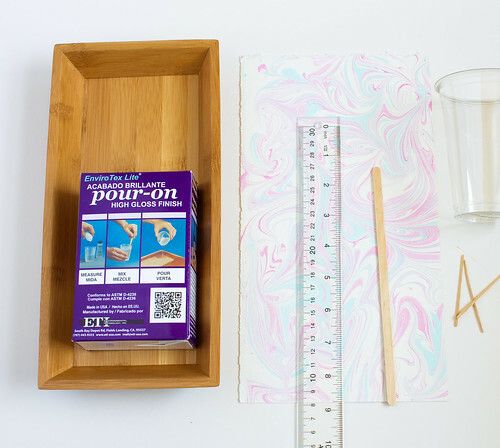 Click here to learn how to marble your own paper and fabrics and here to learn how to make a marbled fabric and leather clutch!